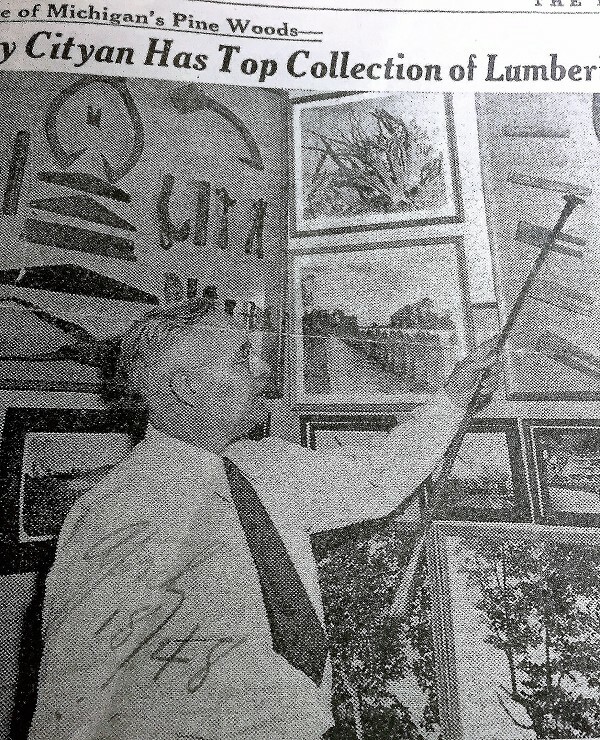 Harry B. Smith, lumbering artifact collector and source of the local origin of the Paul Bunyan legend, shown in a 1948 article in The Bay City Times. Among hundreds of statues of Paul Bunyan around the nation is this iconic steel giant at Alpena Community College. The legendary character of Paul Bunyan, who sprang to life in the Oscoda Press in 1906 under the pen of James T. MacGillivray, has new life 111 years later. Macomb Community College is highlighting Paul Bunyan along with 32 other topics during its "Tall Tales and Folklore: Exploring Michigan's Traditional Stories" festival that runs until May 6. Yours truly will be presenting "Paul Bunyan: Not A Myth, A Real Lumberjack After All," Wednesday, April 5 at 11 a.m. at the MCC campus in Warren. Program coordinator Meghan Mott says there are 350 advance registrations for the presentation. Certainly we won't be able to match the "Werewolves of Detroit" presented last week by Gerald Wykes, who retells traditional folktales brought to early Detroit by French immigrants, including Loup Garou (the werewolf), Le Lutin (the horse rider), and the terrifying Feu Follet. But we will recount the folklore history of a world-renowned figure who has entertained and delighted Americans for more than a century, growing and gaining fans every year. Even though it was written nearly 25 years ago, my book "Paul Bunyan: How A. 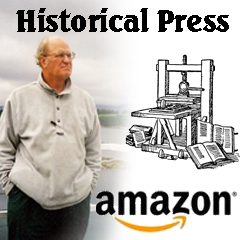 Terrible Timber Feller Became A Legend" still thrives even though it is more history than fantasy like most books on Paul Bunyan. It was the most serendipitous story I have ever done since James T. MacGillivray was the uncle of Ronald K. MacGillivray, longtime city engineer, who made some connections with his relatives for me to get more information on the early Bunyan stories. And pieces of the story kept falling into place, popping up occasionally and confirming the Bay City connection to the legend. My presentation at MCC involves how the legend was traced to Bay City since the main model for the legendary figure was undoubtedly Fabian "Saginaw Joe" Fournier who was murdered on the Water Street ferry boat dock on the Saginaw River Nov. 7, 1875. Stories about Fournier's exploits in the woods and in bar brawls were interwoven with those of a "Bon Jean" hero of the 1837 Papineau Rebellion in Canada, a huge bruiser who swept the Queen's troops away with his sword. We will tell how the transcript of Blinky Robertson's trial for Fournier's murder was found on the 8th floor of the Bay County Building by then County Clerk Steve Toth. The Saginaw Daily Courier covered the trial and surmised that Robertson was freed because Fournier was such a fearsome, disliked person. Not only would he use his double row of teeth to take a bite out of a saloon's wooden bar, proclaiming "Joe Fournier dat hees mark," but he would get drunk and clobber anyone who had the temerity to challenge him. The late Les Arndt wrote a column in The Bay City Times in 1971 about the rumor that a search was underway for Fournier's jawbone, an artifact supposedly on display at one time in the University of Michigan Dental Museum. Oscoda folks found a painting of Fournier's epic fight with another woods giant, Silver Jack Driscoll, at the Red Keg Saloon in Averill, west of Midland. The painting since has turned up missing but we had a photo of it in The Bay City Times in 1972. Harry B. Smith, a resident of Sixth Street who had served in the U.S. Marines during World War I, came up with a tintype of Fournier he had gotten from an old Saginaw Bay fisherman, named Wilfred Talbot, who was a relative of Fournier. Mr. Smith had compiled a tremendous collection of lumbering artifacts, starting with one or two items he found in an antique shop in 1933. He also was the main source of the contention that Paul Bunyan was based on Joe Fournier. That same conclusion was reached in 1930 when lumberjack author James Stevens spent nearly a year here, living in the old Kimbark Hotel on Fifth and Water, hob-nobbing with journalists from the newspaper in swapping yarns about timber times. Stevens also did several months of research in Grayling before producing the definitive book about the folklore tale "The Saginaw Paul Bunyan," nailing down the origin of the tale on the Saginaw River where the killing took place. Threads of the story fused together as time went on, including the fact that the title of the first article on Bunyan, "Round River," was identified in a book by Hazen Miller, "The Old AuSable," as a time-honored Indian canoe route through the AuSable, the Manistee and around the horn through the Straits. In 2005 this author and wife Dolores were hosted by Opera Omaha in Omaha Nebraska for the premiere of the Paul Bunyan Operetta, the revival of a 1941 production by poet W. H. Auden and composer Benjamin Britten. The operetta also hit stages in London, Berlin, Paris, and other places during its revival run. So a crazy Bay City story 45 years ago that started here with a search for a lost jawbone with a double row of teeth is still making news after all these years.